Just a few forlorn steps from Ben & Jerry’s plant in Waterbury plant, visitors will find hallowed, haunted ground. There, amidst the rich foliage, rest the souls of those gone before us, often gone too soon. They are ice creams. 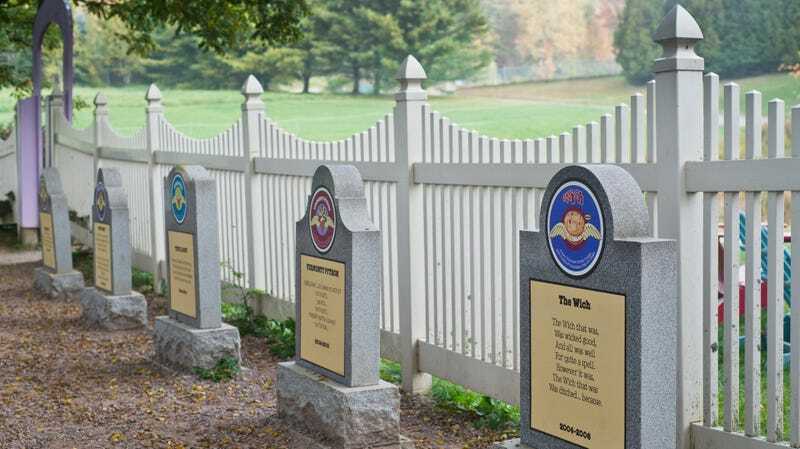 Ben & Jerry’s has a flavor graveyard. This is exactly the kind of silly thing I needed to learn today. The reason I’m learning this now is that the ice cream company is offering samples of its pumpkin pie ice cream—available only at the Waterbury factory—to anyone who pays a visit to the factory and graveyard this Halloween (technically, the window is October 29-31.) So B&J issued a press release, and it is filled with puns, and I am filled with delight. For fans still waiting for their favorites to return, Ben & Jerry’s offers consolation with the Five Stages of Flavor Grief. When What a Cluster melted into oblivion, Ben & Jerry’s held a funeral. The graveyard is now home to 40 flavors, but it began (in 1997) with only four: Dastardly Mash, Economic Crunch, Ethan Almond, and Tuskegee Chunk. If you’d like to pay your respects from afar, fear not: Those still mourning Wavy Gravy can process their loss at the graveyard’s digital counterpart. I am thoroughly charmed, and also hungry. R.I.P. my healthy lunch plans.